Aimless Wanderin’ – Need a Map? In interacting with Rudy Wenk of the University of California Berkeley to get his take on the word “texture” as it pertains to preferred orientation reminds me of some other terminologies with orientation maps that Rudy helped me with several years ago. Joe Michael of Sandia National Lab has commented to me a couple of times his objection to the term “IPF map”. As you may know, the term is commonly used to describe a color map reconstructed from OIM data where the color denotes the crystallographic axis aligned with the sample normal as shown below. Joe points out that the term “orientation map” or “crystal direction map” or something similar would be much more appropriate and he is absolutely right. The reason behind the name “IPF map”, is that I hi-jacked some of my code for drawing inverse pole figures (IPFs) as a basis to start writing the code to create the color-coded maps. Thus, we started using the term internally (it was TSL at the time – prior to EDAX purchasing TSL) and then it leaked out publicly and the name stuck – my apologies to Joe. We later added the ability to color the microstructure based on the crystal direction aligned with any specified sample direction as shown below. Orientation maps showing the crystal directions aligned with the normal, rolling and transverse directions at the surface of a rolled aluminum sheet. The idea for this map was germinated from a paper I saw presented by David Dingley where a continuous color coding schemed was devised by assigning red, green and blue to the three axes of Rodrigues-Frank space: D. J. Dingley, A. Day, and A. Bewick (1991) “Application of Microtexture Determination using EBSD to Non Cubic Crystals”, Textures and Microstructures, 14-18, 91-96. In this case, the microstructure had been digitized and a single orientation measured for each grain using EBSD. Unfortunately, I only have gray scale images of these results. 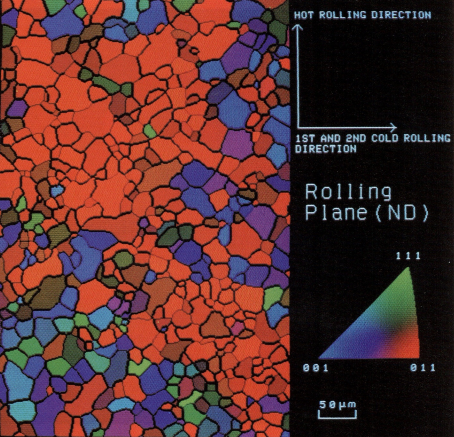 IPF map of recrystallized grains in grain oriented silicon steel from Y. Inokuti, C. Maeda and Y. Ito (1987) “Computer color mapping of configuration of goss grains after an intermediate annealing in grain oriented silicon steel.” Transactions of the Iron and Steel Institute of Japan 27, 139-144. We didn’t realize it at the time; but, an approach based on the crystallographic direction had already been done in Japan. In this work, the stereographic unit triangle (i.e. an inverse pole figure) was used in a continues color coding scheme were red is assigned to the <110> direction, blue to <111> and yellow to <100> and then points lying between these three corners of the stereographic triangle are combinations of these three colors. 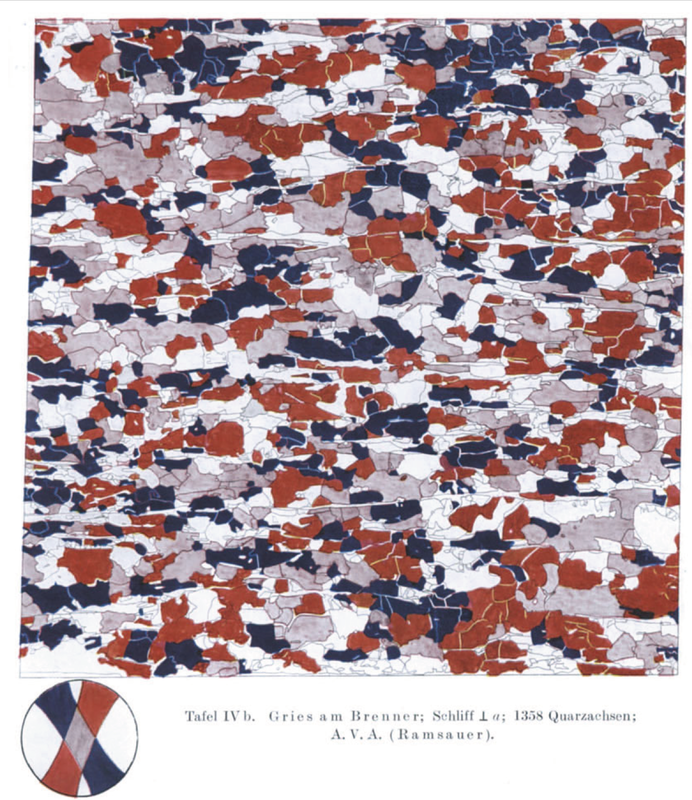 This color coding was used to shade grains in digitized maps of the microstructure according to their orientation. Y. Inokuti, C. Maeda and Y. Ito (1986) “Observation of Generation of Secondary Nuclei in a Grain Oriented Silicon Steel Sheet Illustrated by Computer Color Mapping”, Journal of the Japan Institute of Metals, 50, 874-8. The images published in this paper received awards in 1986 by the Japanese Institute of Metals and TMS. I thought these were the first colored orientation maps constructed until Rudy later corrected me (not the first, nor certainly the last time). He sent me some examples of mappings of orientation onto a microstructure by “hatching” or coloring a pole figure and then using those patterns or colors to shade the microstructure as traced from micrographs. H.-R. Wenk (1965) “Gefügestudie an Quarzknauern und -lagen der Tessiner Kulmination”, Schweiz. Mineralogische und Petrographische Mitteilungen, 45, 467-515 and even earlier in B. Sander (1950) Einführung in die Gefügekunde Springer Verlag. 402-409 . Sanders entitled this type of mapping and analysis as AVA (Achsenvertilungsanalyse auf Deutsch or Axis Distribution Analysis in English). Such maps were forerunners to the “IPF maps” of today (you could actually call them “PF maps”) to which we are so familiar with. It turns out our wanderin’s in A Search for Structure (Cyril Stanley Smith, 1991, MIT Press) have actually not been “aimless” at all but have helped us gain real insight into that etymologically challenged world of microstructure. The EDAX Applications and Product Management teams have been very busy offering free ‘continuing education’ workshops in September and October – with a great global response from our partners and customers. 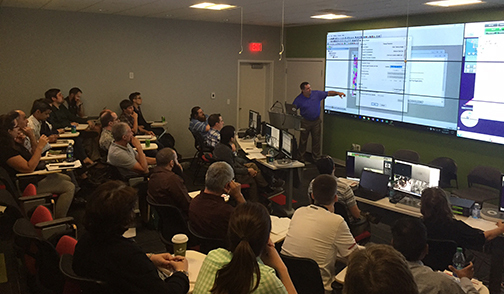 At the end of September, Applications Specialist Shawn Wallace and Electron Backscatter Diffraction (EBSD) Product Manager Matt Nowell joined 6 additional speakers at a ‘Short Lecture Workshop for EBSD’, sponsored by EDAX at the Center for Electron Microscopy and Analysis (CEMAS) at The Ohio State University. The participants attended sessions ranging from ‘EBSD Introduction and Optimization of Collection Parameters for Advanced Application’ to ‘The Dictionary Approach to EBSD: Advances in Highly-Deformed and Fine-Grained Materials’. Matt Nowell presents at the ‘Short Lecture Workshop for EBSD’ at CEMAS, OSU. Dr. René de Kloe presents at one of three recent workshops in India. 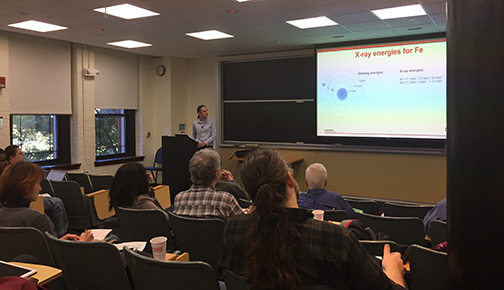 Dr. Jens Rafaelsen presents at the Harvard workshop. Here at EDAX, we are keen to provide our customers, potential customers, and partners with opportunities to improve their knowledge and polish their skills using the techniques, which are central to the EDAX product portfolio. Our EDS, EBSD, WDS and XRF experts enjoy helping with regular training sessions, webinars, and workshops. If you would like to be included, please check for upcoming webinars, workshops, and training sessions at www.edax.com. *A video of these workshop sessions will be available from EDAX in the coming weeks. Call me old-fashioned, but when I want to relax I always try to go outdoors, away from computers and electronic gadgets. So when I go on vacation with my family we look for quiet places where we can go hiking and if possible we visit places with interesting rocks that contain fossils. Last summer I spent my summer vacation with my family in the Hunsrück in Germany. The hills close to where we stayed consisted of shales. These are strongly laminated rocks that have been formed by heating and compaction of finegrained sediments, mostly clay, that have been deposited under water in a marine environment. These rocks are perfect for the occurrence of fossils. When an organism dies and falls on such a bed of clay and is covered by a successive stack of mud layers, it can be beautifully preserved. The small grains and airtight seal of the mud can give a very good preservation such that the shape of the plant or animal can be found millions of years later as a highly detailed fossil. Perhaps the most famous occurrence of such fossil-bearing shale is the Burgess shale in British Columbia, Canada which is renowned for the preservation of soft tissue of long-extinct creatures. The Hunsrück region in Germany may not be that spectacular, but it is a lot closer to home for me and here also beautiful fossils have been found. Figure 1. 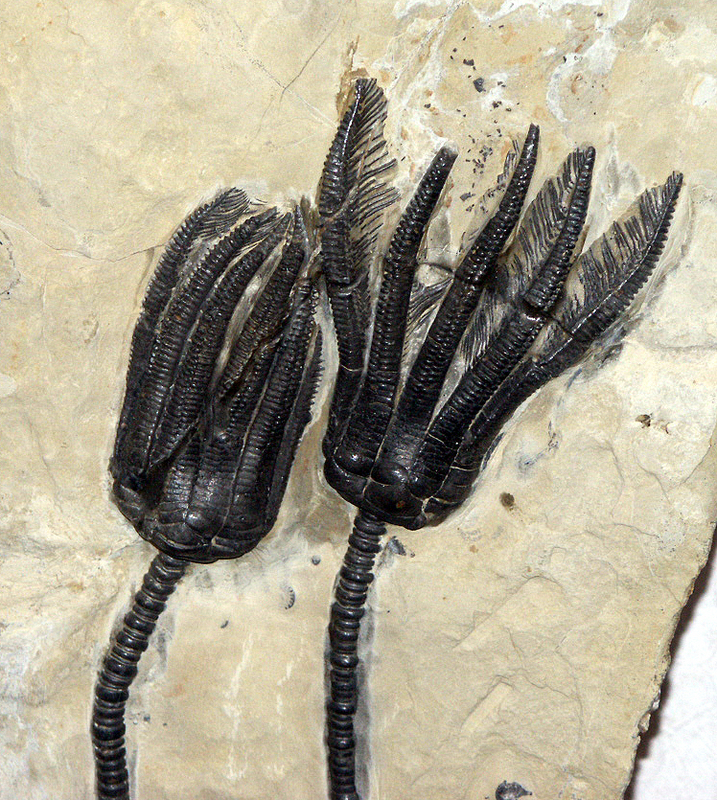 Crinoid or sea lily fossil found in the waste heap of the Marienstollen in Weiden, Germany. Figure 2. Detail of sulphide crystals. So, when we would go hiking during our stay we just had to pack a hammer in our backpack to see if we would be lucky enough to find something spectacular of our own. 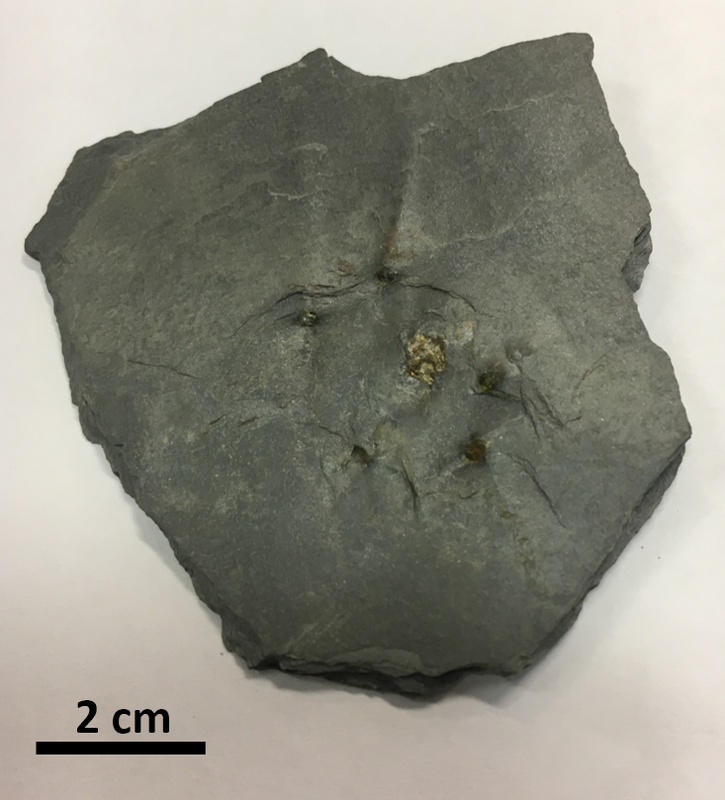 What we found were fragments of a sea lily or crinoid embedded in the rock (Figures 1,3) and as is typical for fossils from the area, much of the fossilised remains had been replaced by shiny sulphide crystals (Figure 2). Locally it is said that the sulphides are pyrite. FeS2. 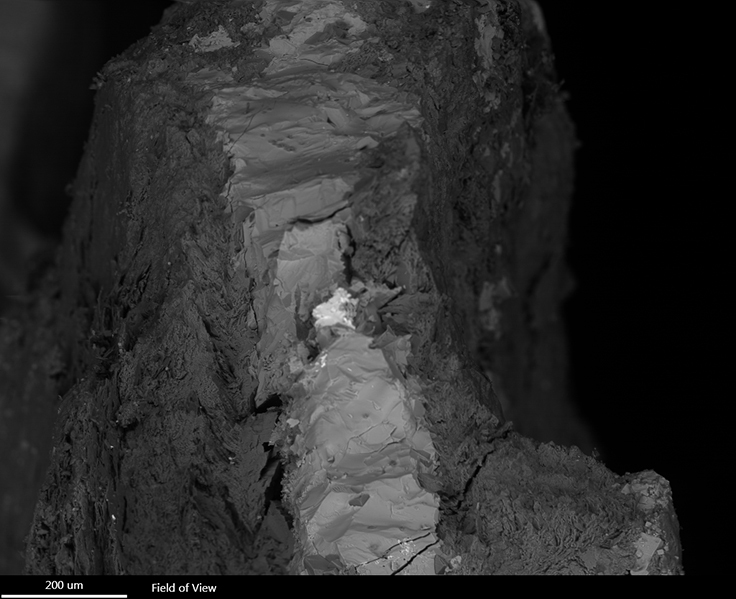 So of course, once back home I could not resist putting a small fragment of our find in the SEM to confirm the mineral using EDS and EBSD. The cross section that had broken off the fossil showed smooth fracture surfaces which looked promising for analysis (Figure 4). 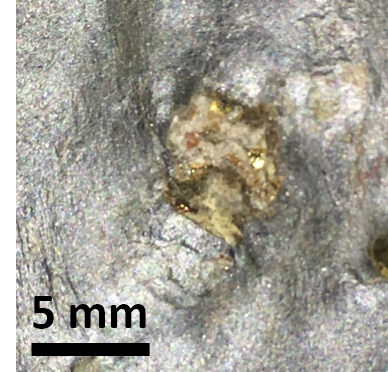 EDS was easy and quickly showed that the sulphide grains were not iron sulphide, but instead copper bearing chalcopyrite. Getting EBSD results was a bit trickier because although EBSD bands were often visible, shadows cast by the irregular surface confuse the band detection (Figure 5). Figure 4. Cross section of shale with smooth sulphide grains along the fracture surface. Figure 5. EBSD patterns collected from the fracture surface. Indexing was done after manual band selection. Surface irregularities are emphasized by the projected shadows. Now the trick is getting these patterns indexed and here I do like computers doing the work for me. Of course, you can manually indicate the bands and get the orientations of individual patterns, but that will not be very helpful for a map. The problem with a fracture surface is that the substrate has a variable tilt with respect to the EBSD detector. Parts of the sample might be blocking the path to the EBSD detector which complicates the EBSD background processing. The EDAX EBSD software has many functions to help you out of such tight spots when analyzing challenging samples. For example, in addition to the standard background subtraction that is applied to routine EBSD mapping there is a library of background processing routines available. These routines can be helpful if your specimen is not a “typical” flat, well-polished EBSD sample. 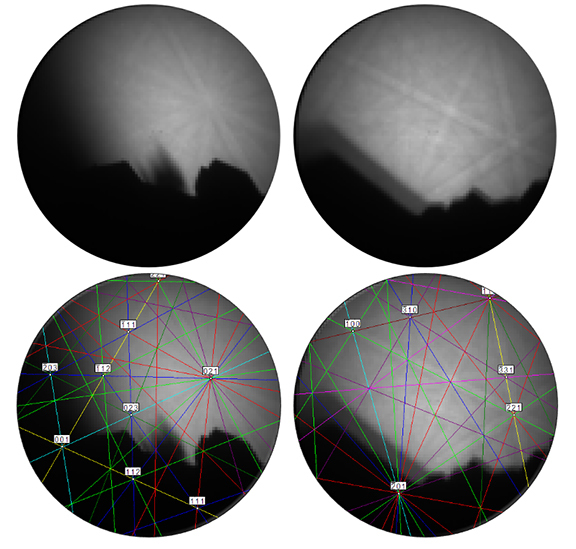 This library allows you to create your own recipe of image processing routines to optimize the band detection on patterns with deviating intensity gradients or incomplete patterns due to shadowing. The standard background polishing uses an averaged EBSD pattern of more than ~25 grains such that the individual bands are blended out. This produces a fixed intensity gradient that we use to remove the background from all the patterns in the analysis area. When the actual intensity gradient shifts due to surface irregularities it is not enough to just use such a fixed average background. In that case you will need to add a dynamic background calculation method to smooth out the resulting intensity variations. This is illustrated in the EBSD mapping of the fossil in Figure 6. 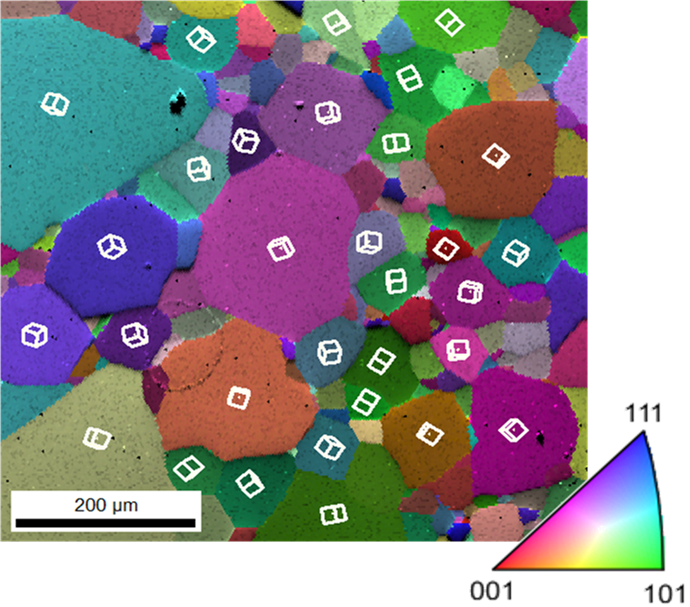 The first EBSD mapping of the fossil using standard background subtraction only showed those parts of the grains that happened to be close to the optimal orientation for normal EBSD. When the surface was pointing in another direction, the pattern intensity had shifted too much for successful indexing. Reindexing the map with optimised background processing tripled the indexable area on the fracture surface. Figure 6. Analysis of the fracture surface in the fossil. 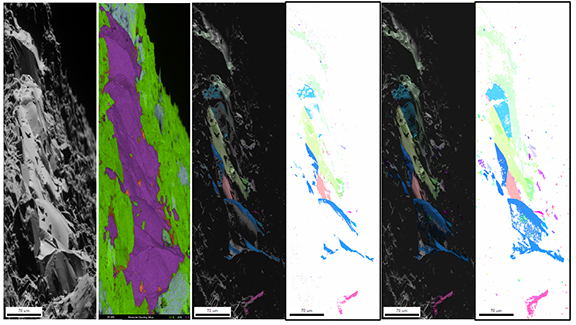 -1- PRIAS center image showing the smooth sulphide grains, -2- Superimposed EDS maps of O(green), Al(blue), S(magenta), and Fe(orange) -3- EBSD IPF on IQ maps with standard background processing, -4- original IPF map, -5- EBSD IPF on IQ maps with optimized background processing, -6- IPF map with optimized background. In addition to the pattern enhancements also the band detection itself can be tuned to look at specific areas of the patterns. Surface shadowing mainly obscures the bottom part of the pattern, so when you shift the focus of the band detection to the upper half of the pattern you can maximize the number of detected bands and minimize the disturbing effects of the edges of the shadowed area. It is unavoidable to pick up a false band or two when you have a shadow, but when there are still 7-9 correct bands detected as well, indexing is not a problem. Figure 7. Band detection on shadowed EBSD pattern. Band detection in the Hough transform is focused at the upper half of the pattern to allow detection of sufficient number of bands for correct indexing. In the images below are a few suggestions of background processing recipes that can be useful for a variety of applications. Of course, you can also create your own recipe of image processing options such that perhaps you will be able to extract some previously unrecognized details from your materials.